Scott & Corley, P.A. announced that its Firm Chairman, Ronald “Ron” C. Scott and Firm President Reginald “Reggie” P. Corley have been recognized by Super Lawyers Magazine® and are 2019 Super Lawyers® selections in the practice area of Creditor-Debtor Rights. Super Lawyers®, a Thomson Reuters business, rates attorneys from more than 70 practice areas and honors lawyers who have attained a high-degree of peer recognition and professional achievement. Results are achieved using a patented selection process which includes peer nominations and peer evaluations. 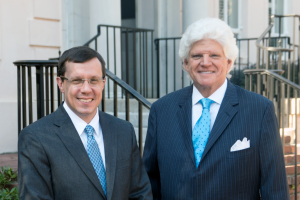 No more than five percent of South Carolina’s attorneys are named to the South Carolina Super Lawyers* list each year. Reggie Corley was selected previously for the prestigious Riley Diversity Leadership Fellow program. Ron Scott has been awarded the Order of The Palmetto, the state’s highest civilian award. Ron Scott was a selection for the inaugural 2018 class of the South Carolina Lawyers Hall of Fame by South Carolina Lawyers Weekly®.